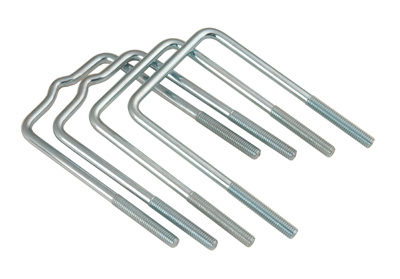 U-bolts for mounting to frames up to 3" wide x 5-1/4" high. For use with our u-bolt mounted guide-ons. 3/8"-16 x 6" long x 3.5" wide with a thread length of 2"
Genuine replacement part for C.E. Smith part numbers: 27600, 27610, 27620, 27625, 27640, 27645, 27660. 5' Bunk board style guide-ons (P/N 27600)require (2) kits, all other guide-ons require (1) kit. From Anonymous of Denver, Colorado on 7/20/2018 . Excellent product. Box came with 5” and needed 6” u bolts. Great company as the allow return on original bolts. The O’Day Rhodes 19” easy launches and more importantly can be taken out of the water even with wind and current against you with bow guides. Excellent product for larger frame. From Anonymous of Easton , Massachusetts on 6/9/2018 . I have a customer trailer and it needed the longer unbolts. They fit and function perfectly as do the guide posts. Excellent product. U Bolts are great quality! From Tom Elias of Bayonne , New Jersey on 6/21/2016 . Very helpful getting larger frame u-bolts.Returned smaller u- bolts for credit.